Total distance: 22 kilometers with about 320 meters of elevation gain (13.6 miles and a bit over 1000 feet of elevation gain). 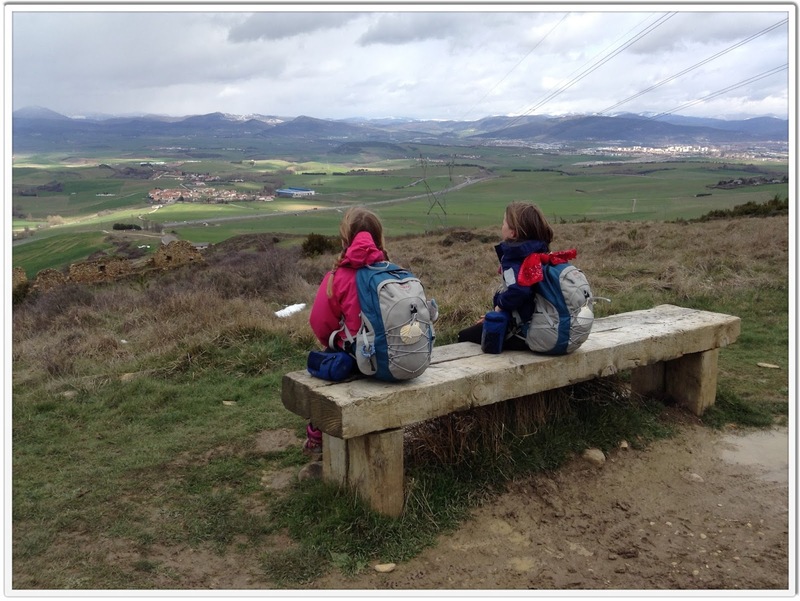 After bidding Hugh a temporary goodbye this morning, the girls and I left the bustle of Pamplona, climbed Alto de Perdon, then walked country roads through rolling hills and green farmland to Puenta La Reina. Puenta La Reina is a good-sized town. We're staying in the monastery hostel run by the Padres Reparadores (I'll post a picture of it tomorrow). It's under construction right now so there's no shower, no heat, and only one bathroom for all the people staying there. The girls and I got our things washed right away so all we have to do tonight is brush our teeth. The cost right now is only three Euros per person, they have blankets, and the rooms are bright and clean, so we don't mind the circumstances that much. Tomorrow we head for Estella. Misc. 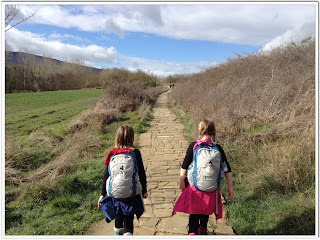 tidbits - our feet are still free of blisters (hooray for HikeGoo! ), the girls are eating about five meals a day, there are a lot of pilgrims even though this is supposedly the off-season, and the weather today was perfect (sunny but cool). Today's thank-you goes to the nice folks who have sent us private messages via Facebook - I appreciate the messages but I can't figure out how to respond via the Facebook app on my iPad. I'll respond to all messages in full when we return from the Camino. Trish, Alex and Sage. 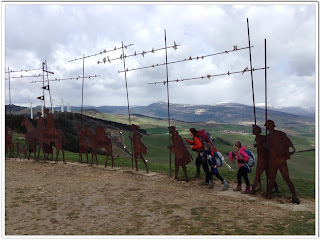 I am having so much fun seeing your photos and reading all about your Camino experiences. 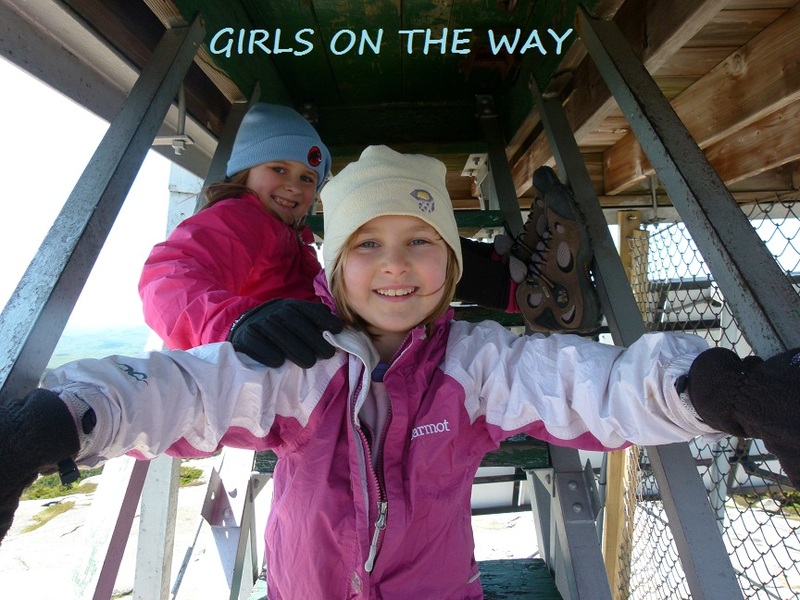 Be well girls! (you too Hugh). It's so neat to see the beautiful countryside. Thanks for taking the time to share your journey. Fingers crossed that the blisters stay away! Your and your girls (not to mention Hugh) are an inspiration for those of us who have yet to start or walk. I will be a month behind you so will keep following your journey for continued inspiration. Thank you! Buen Camino. Trish, please give me an idea of what those 5 meals a day are. Leaving in may with 2 kids and worrying about meals/snacks! There you will find an actuel list of pilgrims refuges, hostales and hotels. The list is written in German but you will be able to decipher it! The winter has come back here with heavy snow!